So we got really lucky. Justine and I flew back to Toronto on the 21st, and for 2-3 days prior to our departure all we heard about was how bad the weather was going to be starting on the Saturday - freezing rain was being called for. Of course, we got a dose of snow in Vancouver on Friday - a good 3-4 inches, which is enough to cause havoc here. By Saturday morning, the roads were fine, and our flight got off OK. As we were leaving the airport the predictions were for the weather to turn very foul, and the rain that was coming down was going to turn to freezing rain and ice. So we cancelled our plans to go to the Skydiggers concert, and drove straight out to Waterdown where Justine's parents live. It was a good decision, as by later that night the place was covered in a good 1/2 inch of ice, and the roads were a mess. 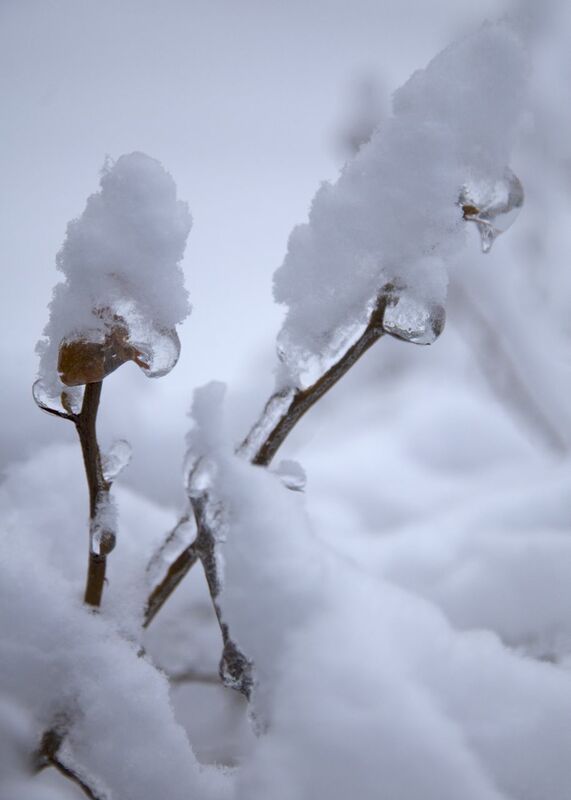 The ice caused a lot of damage, but it also covered everything in ice, which made for some beautiful shots. The couple of inches of snow the next day, followed by some blue skies led to the following pictures. The magnolia tree at Justine's parent's place got off quite lightly in only losing one large branch. The evergreens didn't seem to be as badly affected by the ice, but the branches that did get covered looked amazing. Leaves and branches both got completely covered in the ice. There was a lot of damage to the trees along the street that Justine's parents live on. The maple leaves look amazing in the ice. This house appears to have been very lucky, as the huge branch off the willow tree barely avoids doing major damage. The branches on the willow tree look like they have beads of water running down them. These next few are Justine's pictures (just to give full credit). Christmas Eve was a beautiful, sunny day and the drive from Waterdown to Alton was amazing. It also gave us a chance to see much of the damage that was done by the storm. It was a beautiful, sunny day - you almost wouldn't have know what had just happened a couple of days earlier. You didn't have to go far to see the effects of the ice. The main reason for all the power outages. OK, back to my pictures now. We got dusting of snow on the 23rd, and it just added to the magic of the winter scene.